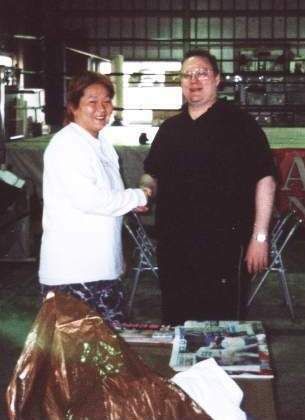 Chigusa Nagayo formed a tag team with Lioness Asuka as the Crush Girls in Japan & the World Wrestling Federation.. The Crush Girls were a huge phenomenon in Japan, having popularity comparative to Hulk Hogan in America..
August 25, 1984: The Crush Girls defeated The Dynamite Girls (Jumbo Hori & Yukari Omori) for the WWWA World Tag Team titles..
February 25, 1985: Crane Yu & Dump Matsumoto defeated The Crush Girls for the WWWA World Tag Team titles..
May 16, 1985: The Crush Girls defeated Bull Nakano & Dump Matsumoto for the WWWA World Tag Team titles..
March 20, 1986: The Crush Girls defeated Itsuki Yamazaki & Noriyo Tateno for the WWWA World Tag Team titles.. The Crush Girls (Chigusa Nagayo & Lioness Asuka) were briefly brought into the World Wrestling Federation.. The Crush Girls did not recieve the same push that the team of The Jumping Bomb Angels got but did wrestle on TV.. The Crush Girls had matches against Lielani Kai, Judy Martin, Donna Christianello, Penny Mitchell, Black Venus, and others..
August 25, 1988: Lioness Asuka defeated Chigusa Nagayo for the WWWA World Singles title..
~~~Lioness Asuka did not accept the Championship because Chigusa Nagayo was injured in the match..
January 29, 1989: Lioness Asuka defeated Chigusa Nagayo for the WWWA World Singles title..
March 4, 1989: The Crush Girls defeated Mika Komatsu & Yumi Ogura for the WWWA World Tag Team titles..